Microsoft offers the smaller 13.5-inch model with a Core i5-7300U on the base model, but once you add a GPU you get the Core i7-8650U. 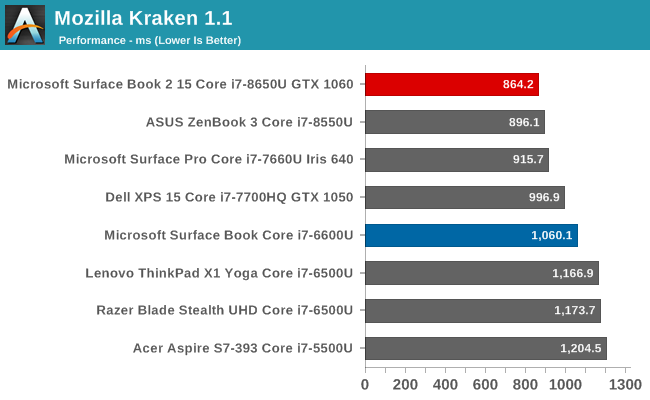 The 15-inch model comes exclusively with the Core i7 model. This is Kaby Lake Refresh, and the refresh is that Intel doubled the physical number of cores in the CPU, going from two to four. The Core i7 models keep Hyperthreading as well, meaning you get eight threads available. Prior to this fall, the only way to get this many cores was to go with the HQ series of processors, which have a 45-Watt TDP. 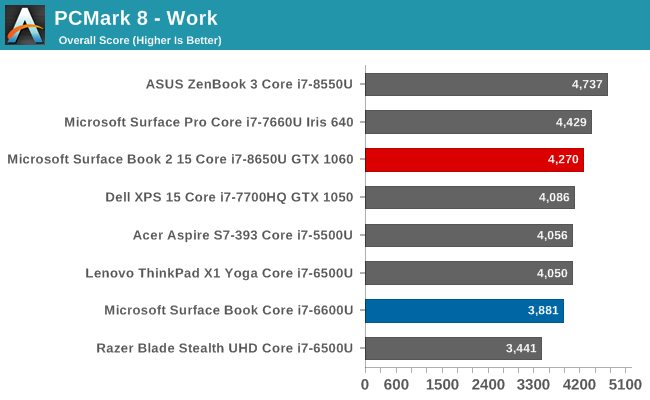 That would be a bit much for a laptop with a detachable tablet, so the 15-Watt Core i7-8650U is a great way to add more multithreaded performance without increasing the heat output. Microsoft has also included the same power management software as the Surface Pro, meaning you can choose your power setting as Best Performance, Better Performance, or Best Battery Life, with the latter being the system default. This adjusts the CPU efficiency by tweaking the PL1 and PL2 levels to lower and higher results, depending on the slider setting. When in the default state, the advantage is that the system fans almost never need to be used, meaning the system is nice and quiet, but if you’re doing something that’s processor intensive, turning it up will improve the performance, with the trade-off being noise. As you’d expect, the benchmarks were run in the Best Performance mode, and battery life testing was done in Best Battery Life. Unlike the Surface Pro, there’s no Iris GPU available, although that’s not a surprise thanks to the much more powerful GPU available in the base, and the fact that Iris isn’t offered yet in the 8th generation products. 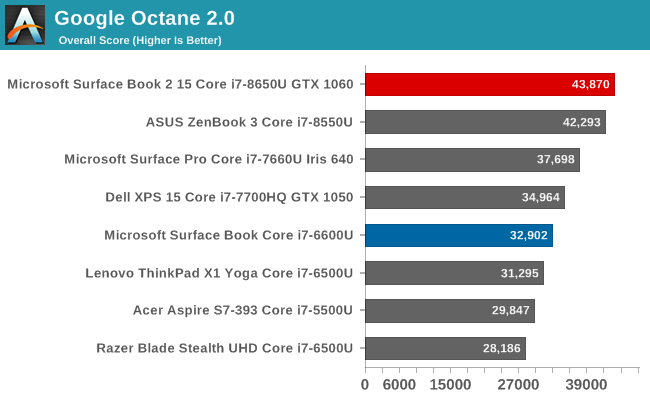 To test CPU performance, the Surface Book 2 was run through our standard suite of laptop tests, and compared to several similar models. If you want to compare the Surface Book 2 against any device we’ve tested, please see our Notebook Bench. PCMark tests an entire system, from the CPU to the GPU to the storage, and all aspects of the device, including things like the display resolution, impact the results. 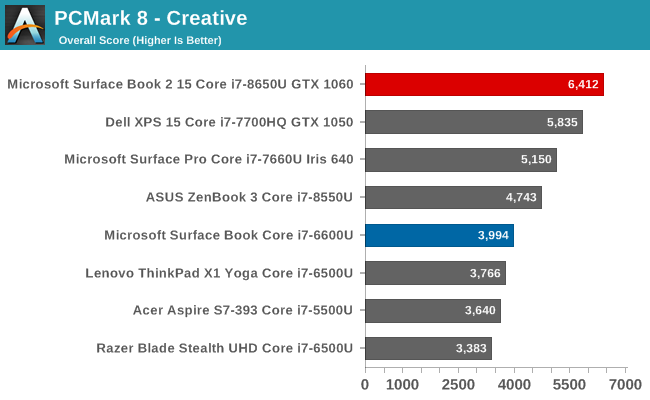 The Surface Book 2 performs well on all of the tests, and it’s unsurprising to see it at the top for Creative, which has several GPU focused tests. Cinebench is a rendering test which can use OpenCL, a single CPU thread, or all CPU threads to render the image. Our test focuses on the two CPU tests, and it gives us a great look at per-thread performance, and how that scales with more cores. Here the high turbo frequency of the Core i7-8650U delivers excellent single-threaded performance, and the multi-core result is also very strong. 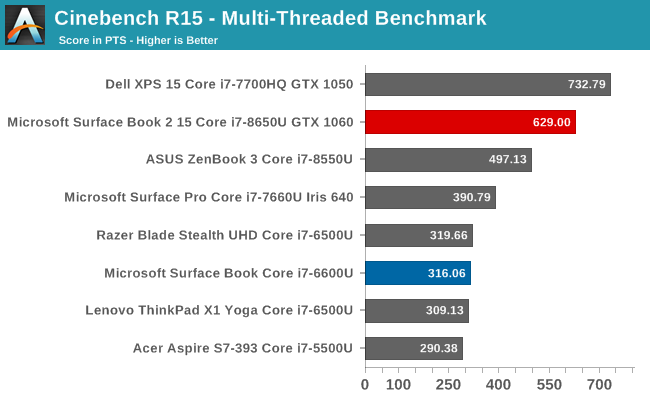 It can’t quite hang with XPS 15, but that has a 45-Watt TDP on its eight threads, allowing them to maintain a much higher turbo for the multithreaded result. Much like Cinebench, the x264 test converts a video using the CPU, and more cores with higher frequency generally wins the day here. 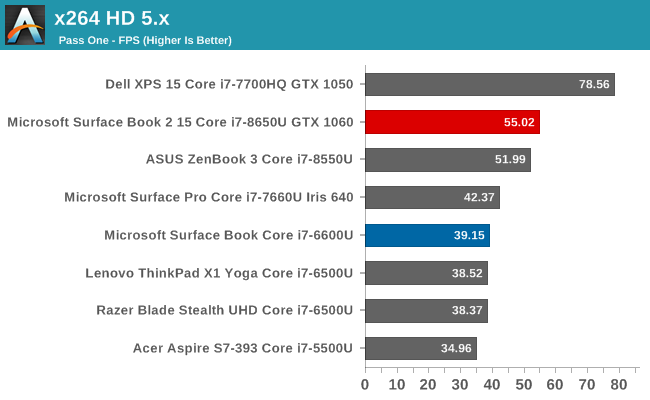 The Surface Book 2 outperforms all other laptops with the 15-Watt TDP U series CPU in this test, but the higher TDP XPS 15 can still outperform it significantly when all cores are utilized. The web is one of the most-used tools around, but performance on the web can be tied to the CPU as well as the browser itself. Over time, scripting performance in the browser continues to improve, and which browser you use will also impact performance and battery life. To make everything consistent, we utilize Microsoft Edge for all testing on Windows. 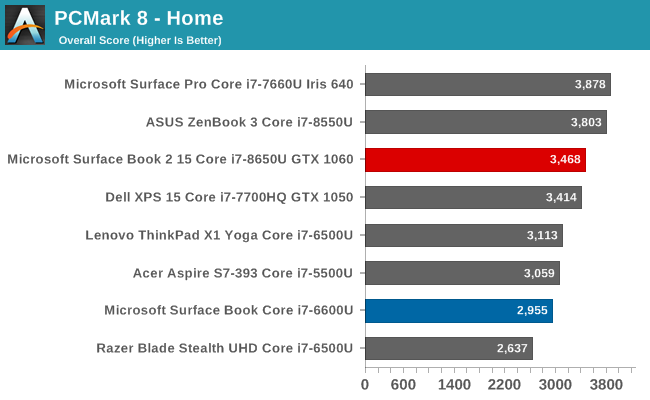 The Surface Book 2 has a slight CPU advantage over the ASUS ZenBook 3, and with that edge it creeps ahead in all of the web tests. The extra cores, as well as the updates to the browser with the Fall Creators Update, have made a significant difference over the older results. It would be nice to go back on some of these older devices to see how much of an impact the browser updates have made, if we still had the devices. 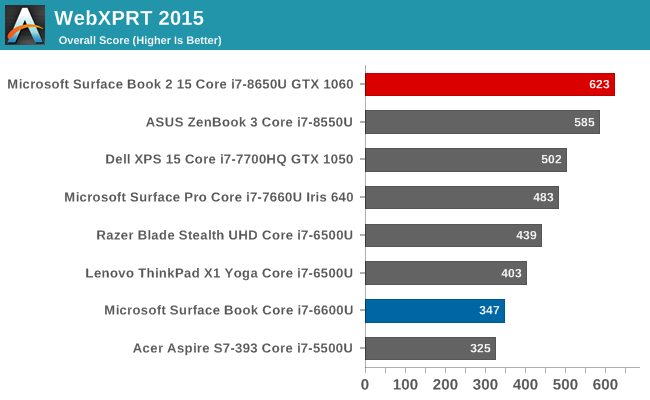 As we saw with the ASUS ZenBook 3, the move to quad-core in the U series of Core chips has been very welcome. 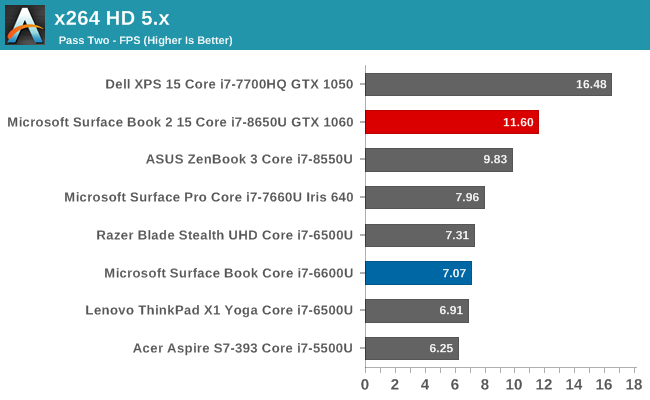 The performance increase is impressive over the older dual-core models, and although the eight threads run into the thermal limit quicker than the do on the higher-wattage HQ series chips, such as seen in the Dell XPS 15, the Core i7-8650U is still a very strong performer. The review unit for the Surface Book 2 shipped with the maximum drive size available, which is the 1 TB model. 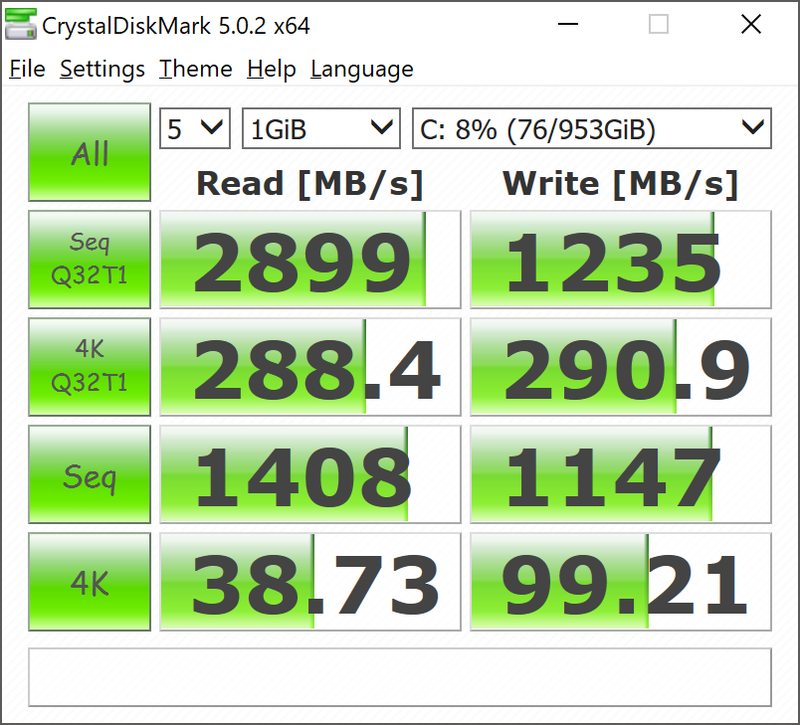 Thanks to the parallel nature of SSDs, this model should offer the best performance. The drive in the unit is a Samsumg PM961, which is a TLC based drive. Performance is excellent for a TLC drive, and we do see the sequential write being affected by the TLC NAND, but all other aspects of the performance are excellent. In a device hitting this price target, a MLC version of this drive would be preferable, but it’s unlikely most people will notice the limits of this drive because it is quite good.